The St. Louis Scottish Rite Organ was built and installed in 1924 by the W. W. Kimball Organ Company as KPO 6763. It was designed by Robert Pier Elliot who worked at Wurlitzer for a while. There is a copy of the contract in the Rite files showing a cost of $50,000. However, they received a 5% discount for paying cash, so the check was for $47,500. There are 53 Ranks containing 3,847 pipes in 5 chambers. The Great/Choir, Solo and Swell are on the left side of the auditorium just above the console which is on the second level balcony. The Antiphonal is on the opposite side of the auditorium. The Echo speaks from a chamber in the ceiling midway. It is an eight foot organ, meaning there are no 16, 4, 2, foot ranks except for the 32 foot Bombarde in the Pedal. There are a few theatre style ranks such as a Tibia and Kinura, and all the tuned and untuned percussions found in theatre organs. The pipes, chests, and chambers are exactly like they were in 1924. The organ had some ups and downs, and in the ‘90’s it was decided to replace it with an Allen 3 manual theatre organ which remains. Luckily, the Kimball stayed intact, although it was almost sold in 2007. The Saint Louis Theatre Organ Society took over the maintenance and put some “duct tape and bailing wire” in critical places. 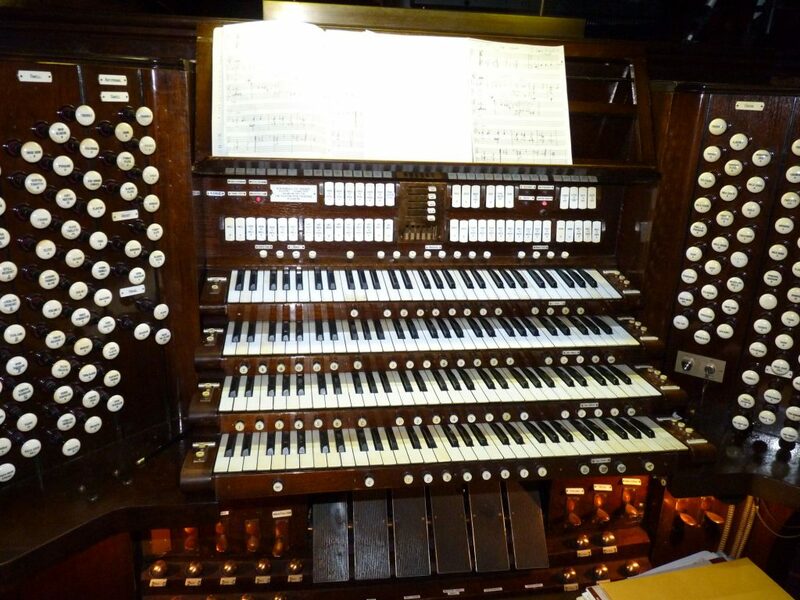 In 2011, we made a proposal to the Scottish Rite Preservation Association to upgrade the organ with a Uniflex Relay and totally clean and refurbish the instrument with all volunteer help. This was completed, and as you can tell from your eyes and ears, was a total success.